You're probably asking, "Now, what does THAT have to do with translation and/or language teaching? Well, that has a lot to do with Russian culture, and teaching about culture is an inseparable part of any language teaching. So if you would like to know a little bit more about our culture, this post is for you. 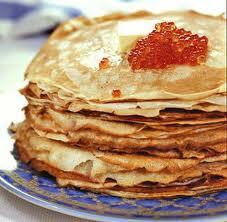 Pancake Week, or Maslenitsa, is here now. It's one of the most popular traditions here that dates way back to pagan times. Then it was a sun festival celebrating the end of winter. Later on, when Russia became Christian, this tradition got a different meaning since it's the last week before Great Lent. During this week Orthodox believers aren't allowed to eat meat, but they are supposed to eat a lot of dairy products since they won't be allowed to have anything like that till Easter. That's why this week is sometimes called Cheese Week, or Butter Week. During Lent any festivities are also forbidden, so it's the last chance for people to participate in fun celebrations and to socialize. 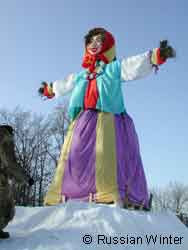 Every day of Maslenitsa week has its own name and special traditions that need to be observed. · Monday – Greeting. In good old days, people would make ice-hills, swings and other preparations for the festivities on Monday. Maybe they do it now in some places, too. I haven't observed anything like that in my city though. Some people also start making pancakes (the best part of the whole week for many adults and children). · Tuesday – Festivities' Start. In the morning young people were invited to take part in different fun activities outside. · Thursday – Rachery Thursday, or Grand Rachery. That was the day when all the great celebrations started. People got involved in various activities like sledding, riding on swings, snowball fights etc. · Friday – Mother-in-Law Party. Sons-in-law would invite their mothers-in-law for a visit and offer them pancakes. · Saturday – Daughter-in-Law Party. Young daughters-in-law would invite their mothers-in-law. · Sunday, last day of Maslenitsa – Forgiveness Sunday. One this day people would ask one another for forgiveness. They still do that. The response is, "God will forgive, and I forgive". Thus Great Lent is supposed to start in the spirit of forgiveness and Christian unity. Why do people love Maslenitsa? Because is all about spring, new life, new beginning. I guess Russian people are a truly optimistic nation since we celebrate the coming of spring while the earth is still covered with snow and it's pretty cold outside. The snow won't usually melt till the end of March and often till the beginning of April. I remember a couple years ago we were celebrating my daughter's birthday on April 20th, and there was a snowstorm outside. So by the time March comes, people get so tired of winter that all they want is to "kill" it and do everything possible to make it go away faster. The week ends with a big open-air celebration called Great or Wide Maslenitsa where people get to eat lots of pancakes (of course), take part in different games and folk dancing, and the culminating point of the whole celebration is when a straw effigy of Lady Maslenitsa symbolizing winter and death is burnt. I am not sure if they used to do that or not, but now during such celebrations people are sometimes invited to write down their problems and fears on pieces of paper and stick them to Lady Maslenitsa to burn them with it. This week is very special to me. Not just because of pancakes though they are definitely good =) I love Maslenitsa for the feeling of unity that it gives. And Maslenitsa is usually a sign to me that I need to start preparing my heart and my house for Easter.